In this knowledge age, community of practice serves as a model to facilitate and enhance learning and knowledge management in a shared context among practitioners. Cambridge, Kaplan, and Suter (2005) suggest that communities of practice provide an environment for people to connect, interact, build and extend the shared resources within shared learning goals. A community of practice that is cultivated and effectively operates can result in improved practice. Reflecting on practice is an active learning process whereby practice is analysed in its applied context. This is the point where theory and practice meet and are refined and developed. This reflective practice is underpinned by the notion of reflection-on-action, and continual learning for improved outcomes. Finlay (2008) called attention to the “bland, mechanical, unthinking ways” (p.1) of reflective practice, especially for time-constrained professionals. Without critical reflection, superficial thinking might simply reinforce existing assumptions. Therefore, it is important that reflective practice be cultivated and fostered to become effective. It can then be a “powerful tool to examine and transform practice” (Finlay, 2008, p.10). 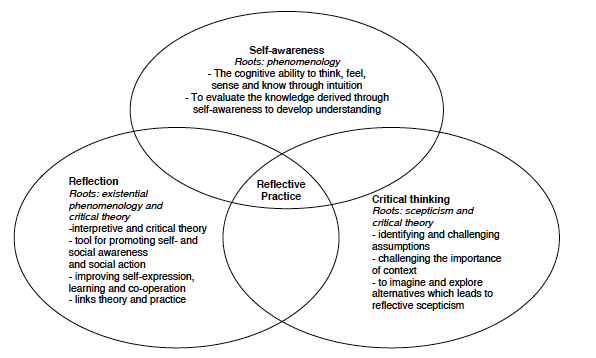 Developing critical reflection in your practiceAccording to Fook and Askeland (cited in Finlay, 2008), critical reflection looks at individual concerns within a wider perspective, “connecting individual identity and social context”. It should be done in a systematic manner, be challenged by differing angles and be informed with reliable sources. "Rapid reflection - immediate, ongoing and automatic action by the teacher. Repair – in which a thoughtful teacher makes decisions to alter their behaviour in response to students’ cues. Review – when a teacher thinks about, discusses or writes about some element of their teaching. Research – when a teacher engages in more systematic and sustained thinking over time, perhaps by collecting data or reading research. Larrivee (2000) recommends that keeping a reflective journal is a way to ensure time is set aside for deep and regular reflection. A reflective journal enables you to integrate knowledge and learning and analyse the significance and implications for your professional practice. Electronic journals are able to be shared with others, so there are opportunities for you to share and create networks, whānau of interest, and professional communities of practice. A reflective journal is an important evaluative learning tool for you as a learner and as a professional. Sharing aspects of your journal and working collaboratively in shared e-reflective journal spaces is part of the reflective process. The feedback you give and receive can be critical for further investigation, reflection, and change. What is your community of practice? Your teaching practice is based on a particular context within the community that you serve. Wenger first coined the concept of “communities of practice”, which are defined as “groups of people who share a concern or a passion or about a topic, and who deepen their knowledge and expertise in this area by interaction on an ongoing basis” (Wenger, McDermott & Snyder, 2002, p.4). A community of practice differs from other group types in terms of learning and knowledge and practice sharing rather than management objectives. In the school context, this occurs through informal learning via daily conversations, lesson reflections and other exchanges (Jurasaite-Harbison & Rex, 2010). A community of practice is defined by three distinct elements: joint enterprise, mutual engagement and shared repertoire (Wenger, 2000). Joint enterprise: is a shared domain which is the “collectively developed understanding of what the community is about”. Mutual engagement: within the community, the members engage through interactions, building mutual trust in the relationships. On the Wenger-Trayner website, the three elements have been termed as domain, community and practice, respectively. In order for a community of practice to thrive, its members have to ensure that they are collectively working on all three elements. Regardless of the community size, it is important that the members understand the community of practice’s shared purpose and strongly feel they belong to the community. They also have to commit to regular interactions to keep the dynamics of the community of practice. These interactions either onsite or online would lead to the accumulation of the community of practice’s shared resources which in turn becomes valuable assets that the members can turn to when they seek assistance. Step 1: Identify your community of practice. When doing so, you may realise that you belong to a variety of communities of practice which are sometimes overlapping. However, you need to be careful that the identified one is a community of practice not a community only. Being able to articulate the three elements of the community of practice that you have identified will clarify the criteria. What is the joint-enterprise or the shared domain of interest that you identify with your community of practice? What are some examples of the activities or events that the members in your community of practice engage? How often do the activities or events take place? What kind of shared repertoire does your community of practice produce? What sense of connectedness or belonging do you have within your community of practice? How would you describe your role within the community of practice? For example, a leader? A facilitator? An active member? A newcomer? At what extent you are contributing towards your community of practice? * Please note that all of the above questions serve as a guide to your reflection. When writing your reflective journal, you don’t have to answer each and every question. Who is your community? Layers? Practices community engaged with? Domains share? How to connect? Finlay, L. (2008). Reflecting on reflective practice. The Open University. In general, reflective practice is understood as the process of learning through and from experience towards gaining new insights of self and/or practice (Boud et al 1985; Boyd and Fales, 1983; Mezirow, 1981, Jarvis, 1992). This often involves examining assumptions of everyday practice. It also tends to involve the individual practitioner in being self-aware and critically evaluating their own responses to practice situations. The point is to recapture practice experiences and mull them over critically in order to gain new understandings and so improve future practice. This is understood as part of the process of life-long learning. Dewey (1933) was among the first to identify reflection as a specialised form of thinking.He considered reflection to stem from doubt, hesitation or perplexity related to a directlyexperienced situation. One of his most important and enduring contributions was to identify two types of reflection: reflection-on-action (after-the-event thinking) and reflection-in-action (thinking while doing). For Reynolds (1998), four characteristics distinguish critical reflection from other versions of reflection : (1) its concern to question assumptions; (2) its social rather than individual focus; (3) the particular attention it pays to the analysis of power relations; and (4) its pursuit of emancipation (Reynolds, 1998). In the field of teaching, Brookfield (1995) characterises critical reflection as ‘stance and dance’. The critically reflective teacher’s stance toward teaching is one of inquiry and being open to further investigation. The dance involves experimentation and risk towards modifying practice while moving to fluctuating, and possibly contradictory, rhythms (Larrivee, 2000). · reorientation, i.e. using the results of self-evaluation to influence future approaches to similar situations or experiences.” (Quinn, 2000, p.82). Wenger, E.(2000).Communities of practice and social learning systems.Organization,7(2), 225-246 (Link to the article in Unitec Library).